My exposure to Korean cuisine when growing up was limited to the glass jars of kimchi my mom would always keep on hand in the fridge. My dad loved that stuff; there was always a bowl of it on the table to accompany every dinner we had at home. It didn’t matter that we ate mostly Chinese and Thai food in our household. The sour, bubbly, chili-red cabbage went with everything, at least for my dad. I soon got accustomed to eating it too, and swirling other things off my plate in the pickling juice as if the quick dip would magically turn them sour and spicy as well. It probably wasn’t until college when I had my first taste of Korean food, and with the exception of a good friend who would occasionally make dishes like kimchi fried rice and kimchi chigae, Korean BBQ was the epitome of the cuisine. Living in Southern California we have a fairly large Korean population, and therefore probably the best variety of restaurants outside of Korea. So it’s somewhat embarrassing that until relatively recently, Korean food to me consisted of beef grilled at the table served with assorted banchan (side dishes), and of course a healthy serving of kimchi. You can imagine how excited I was to really immerse myself on my first visit to Seoul. It was going to be Korean food everyday, every meal, for almost a week. Below are a few dishes and restaurants we went to that weren’t just about beef on a grill. 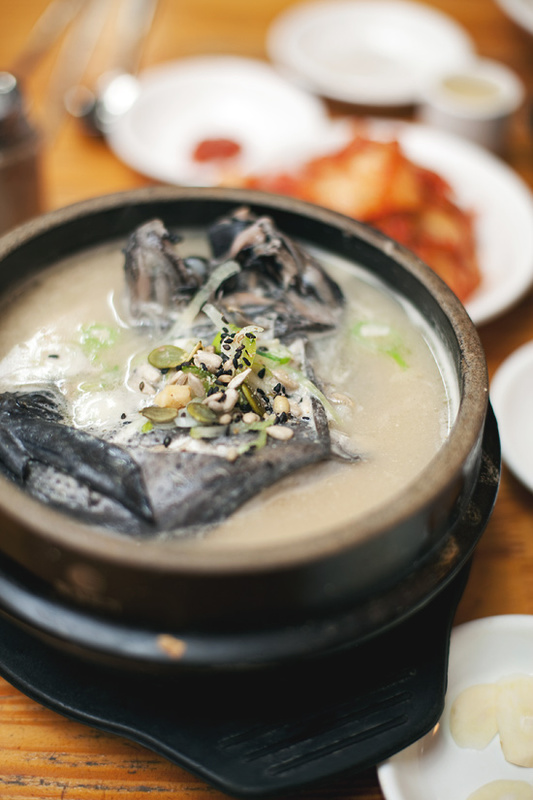 The western world has chicken noodle soup, and Koreans have samgyetang. This comforting soup, made with young whole chickens stuffed with glutenous rice and simmered in a broth of ginseng, jujubee, and ginger, is believed to have medicinal qualities able to prevent and cure illnesses and ailments. Even more potent is the ogolgye samgyetang, which uses a rare and sinister-looking black chicken breed. Though this soup is popular during the hottest days of summer (to replenish lost nutrients), we found it to be a perfect way to warm up on this chilly winter afternoon. Laying claim to being the oldest and largest in Korea, Namdaemun Market has anything and everything you could ever need in one sprawling area, but shopping wasn’t on our agenda. We headed straight to Mokja Golmok (literally meaning “Let’s Eat Alley”) within the market for a little something to eat. In this chaotic culinary gauntlet, you will find a jam-packed assortment of tiny kitchens with counters and stools where you can pull up a seat and fill up quick and on the cheap, a sort of working class food court. Some of the common offerings in Mokja Golmok are sonkalguksu, a soup of hand-knifed or cut noodles, tofu, laver seaweed, and chili paste, soojaebi, another noodle soup but one made with hand torn dough ‘flakes’, janchiguksu, thin somen noodles in an anchovy broth, and jeon, various vegetables, seafood, and meat, egg-battered and fried. 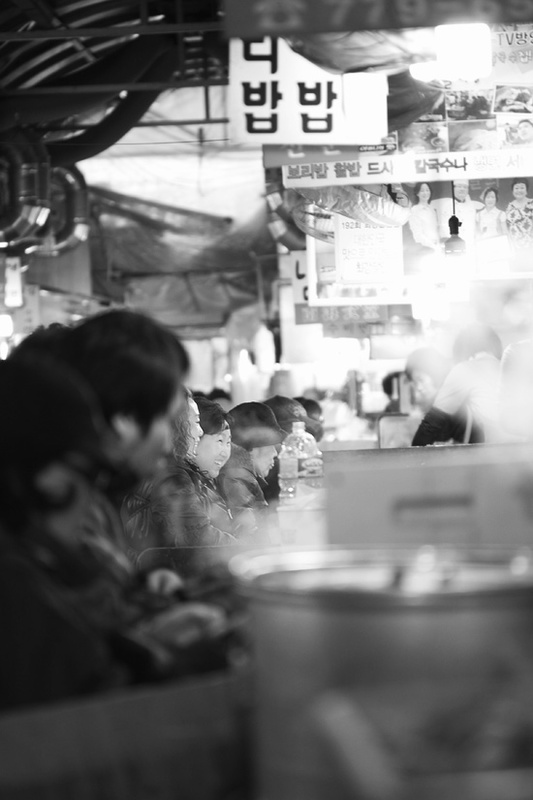 As you negotiate your way down the narrow, crowded walk, shop owners will try their best to lure you into their stall; waving, gesturing and even switching between phrases in Korean, Japanese, and Chinese to broaden their reach. It’s good to make one full pass before committing to one choice. After perusing the many offerings of Let’s Eat Alley, we decided upon a stall at the opposite end of where we entered. 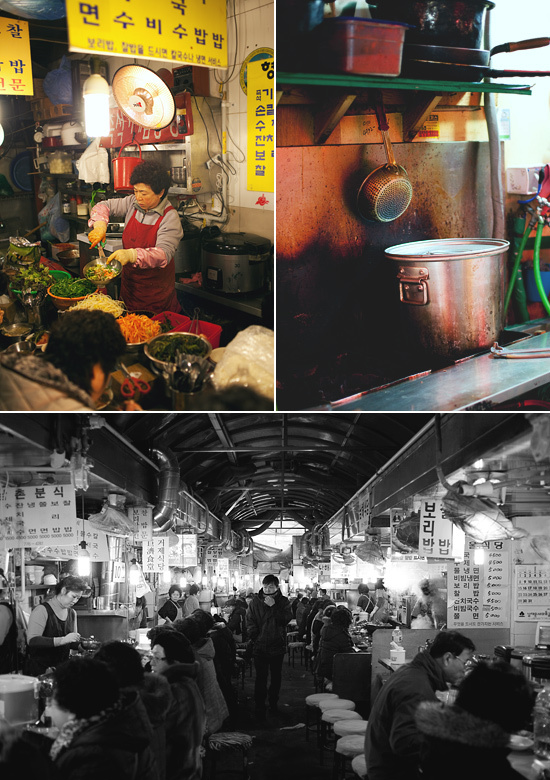 Devoid of the incessant sales pitches and constant chatter, the two adorable ladies running this kitchen went about quietly preparing steaming bowls of soondae gukbap. This modest soup consists of assorted cuts of pork offal (lung, kidney, liver), slivers of pig ear, and cooked rice, topped with a handful of chopped scallions and a heaping mound of wild sesame (also known as perilla seed). Nestled within the various ingredients are slices of soondae, a Korean blood sausage stuffed with rice and glass noodles. Each bowl was finished off with a few ladles of piping-hot pork bone broth, and the customer is left to add condiments of minced garlic, sliced fresh chilies, chojang (vinegared red pepper paste), and kkakdugi (radish kimchi) juice to taste. Forget any preconceived notions you might have about miscellaneous pig parts and innards, our soondae gukbap was hearty and delicious, without any off-putting flavors you might imagine a dish like this having. Best of all it was cheap and made with lots of love. If you were to ask me what my favorite dish was during my trip to Seoul, my resounding answer would be galbijim. I have to admit the meager presentation of grisly meat and bones wasn’t the most appetizing and photo-worthy, but after one bite of these tender, savory-sweet short ribs and I was hooked. Don’t be too eager to polish off every last morsel however, as you can ask for bokkeumbap (fried rice) and they will take the remaining bits of meat and make a killer crispy rice in the same earthenware dish. In parts of Asia where bamboo is abundant, it’s quite common to find this versatile material used for just about everything, even as a cooking vessel. In the case of daetongbap, short grain rice, ginko seeds, jujube, and chestnuts are steamed within short sections of the stalk, a process which imparts fragrance from the bamboo’s natural oils. The ones we sampled also had a piece of bamboo charcoal dropped in there, purportedly to remove any impurities from the cooking water. The bamboo even makes a neat little rice bowl, though for some (carb lovers like me) it’s probably too small of a portion. 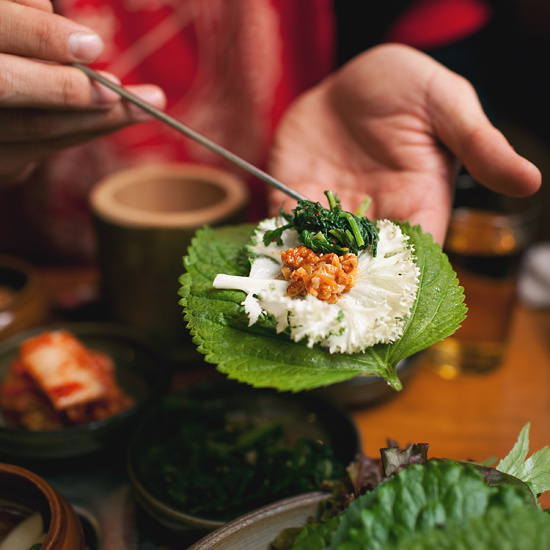 That’s probably besides the point, because at Ouga the daetongbap shares the stage with excellent grilled beef and pork, and the most pristine leaves of perilla, cabbage, and lettuce in which to wrap your meats. 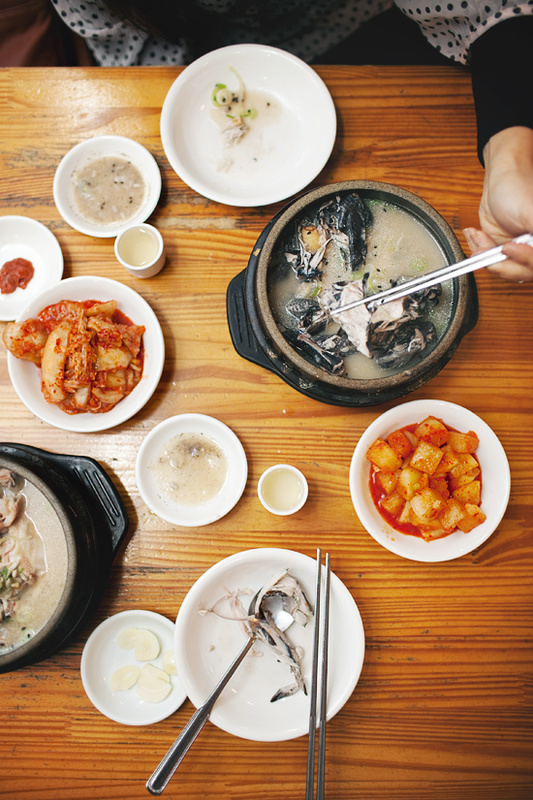 It goes without saying that there exists an overwhelming curiosity of South Korea’s volatile and confined neighbors to the north; case in point, the popularity of North Korean cuisine in Seoul. While the ubiquitous cold noodle soup naengmyun, which originates from the north can be found all throughout Korea, it’s lesser-known cousin kimchi mari guksu has just recently been gaining popularity. Rice noodles and a chilled vinegary-tart broth (made from the juice of mool kimchi) make this dish especially refreshing during the hot days of summer. While not from the North, dduk galbi was also a popular item at Nun Namu Jib, where we enjoyed our kimchi mari guksu. It looks like a hamburger patty/salisbury steak of sorts, but dduk galbi is typically made from chopped marinated beef short rib (sometimes fortified with pork for it’s extra fat content). The dduk in the name are the finger-shaped rice flour cakes that are served alongside or on top of the patty. 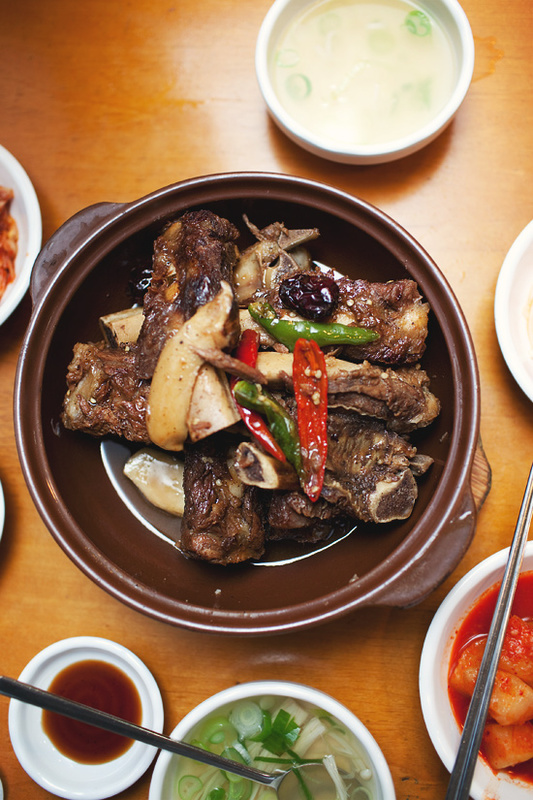 It’s got the familiar flavors of galbi, just in a different form factor. Dare I say, it might make an interesting burger! A stew of instant ramen noodles, cut-up hotdogs, spam slices, kimchi, in a broth flavored with gochujang (red chili paste), budae jjigae would appear to be something concocted by starving students in college dorm rooms around the world. 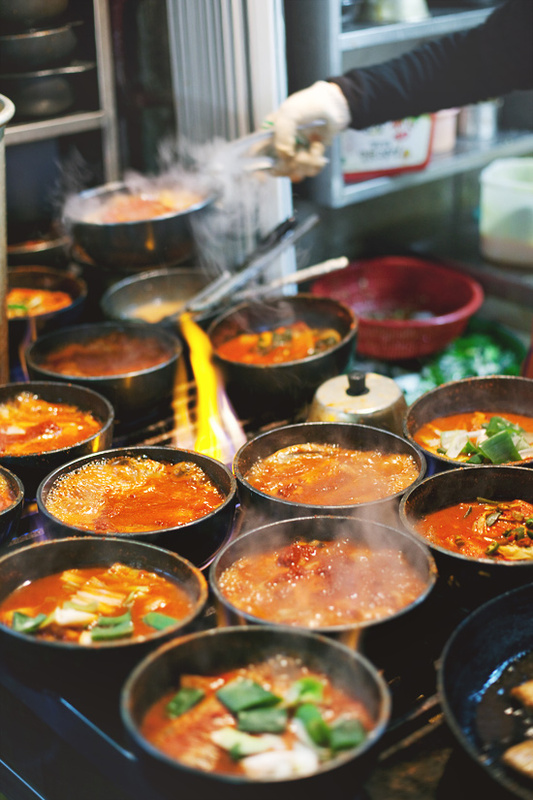 Literally meaning ‘army base stew’, budae jjigae was however born out of circumstance and necessity after the Korean War, when food was scarce and surplus rations from the bases were used to make this ‘fusion’ noodle dish. 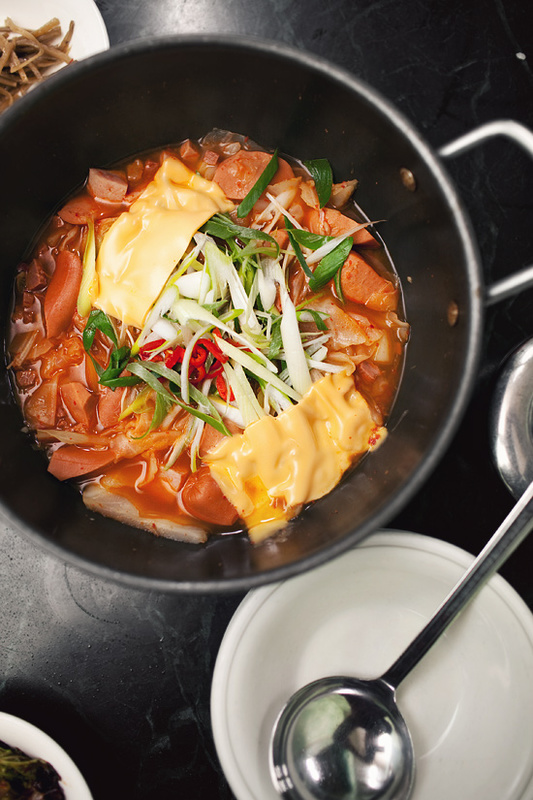 In this Itaewon-area version, American cheese slices are added which melt into the hot broth to add a subtle creaminess to the soup. For me, samgyupsal was just another one of the lesser meats that accompanied the brimming plates of bright-red galbi (short rib) and chadol (thinly sliced brisket) at Korean BBQ restaurants. Its rubbery texture and relatively long cooking times on the cook-it-yourself grill did nothing to help matters. 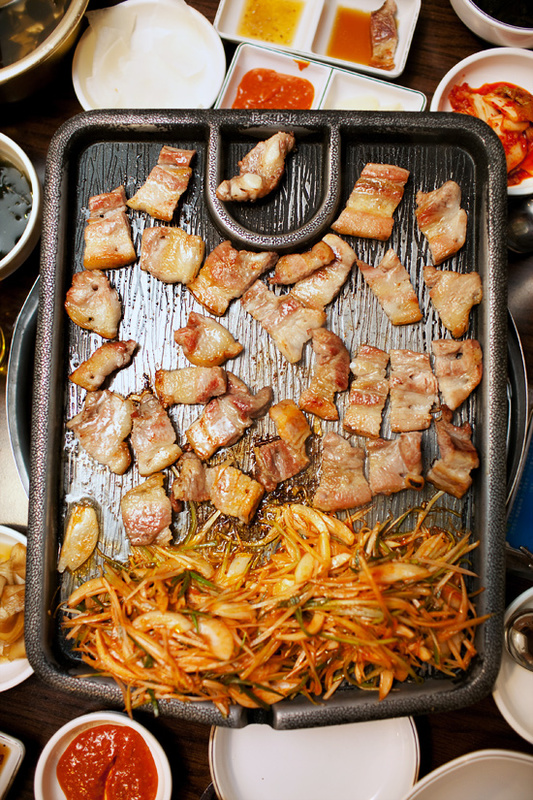 But when you go to a restaurant that specializes in samgyupsal, things are a bit different. 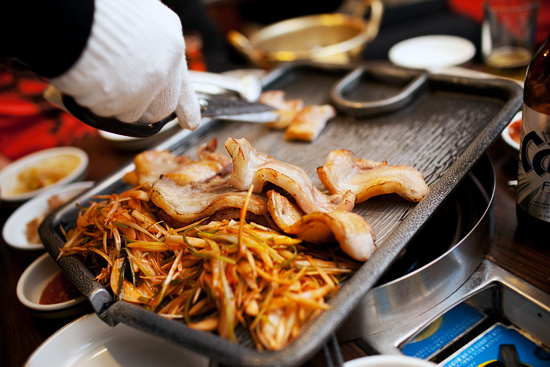 At Guhl Goo Nae Wang Gob Chang, pork is king and their samgyupsal is first grilled in the kitchen on skewers and then brought out to finish at the table. The result: crisp, golden caramelization and juicy interior, and best of all no wait! 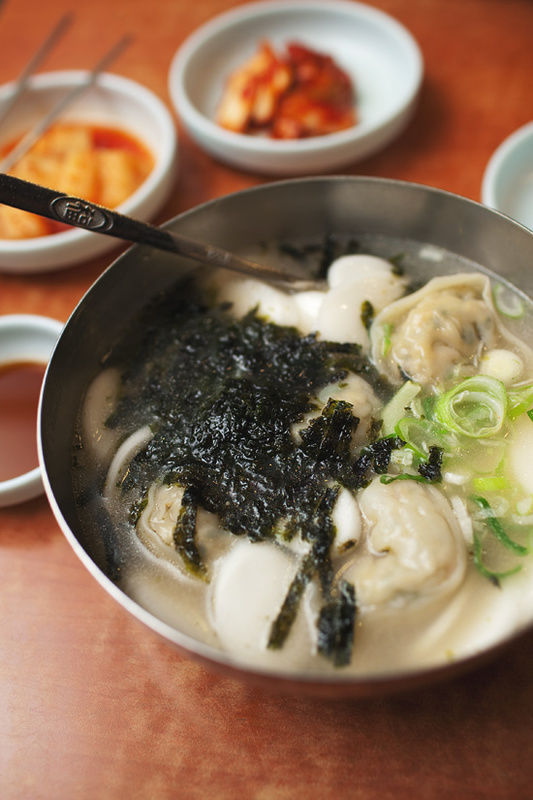 A tradition for Koreans is to eat dduk mandu guk on new year’s day. Since we spent the end of 2011 and the beginning of 2012 in Seoul (yes, this post is long overdue), we partook in our own celebratory meal, sharing a bowl of this light, clear broth soup consisting of dduk (sliced rice cake) and mandu (dumplings filled with ground beef, tofu, and glass noodles), and of course raising a glass to a great new year. beautiful articles and images of a place i like to call one of my homes. my husband is korean so i am honored to spend vacations there, learn about the culture, and eat this fabulous food. thank you for a mini-vacation via your post. i love korean food, it definitely makes my heart jump and skip a beat thanks for sharing hopefully i will be able to make it out there soon! my mouth is literally watering looking at these photos. you capture the essence of our trip and the amazing foods we ate perfectly. love it. I just absolutely LOVE your food photo journalism. This is exactly the kind of stories that I like to show…fooooooood and travel..and foooood. All of the dishes look fabulous. The pig’s ear/offal stew would be the kicker dish to try something fabulously different. Hey, if Mr. Bourdain can taste it all!!? Thank you for whisking me away from my lunch to Seoul, Korea! It’s really accurate descriptions of the foods that I think I know so well cause I’ve been eating them for more than 60 years. Fantastic entry, much respect to your creative abilities. I love perilla leaves, move over shiso! Your photos are incredible, I’m in a mouthwatering food daze after reading this. I was just in Seoul a few months ago and got to try a number of these same dishes. I really enjoyed Korean soondae, but unfortunately I never knew about the stew made with soondae – that looks fantastic. Something else I also really loved was the kimchi mari guksu, which at first sounded bizarre filled with ice, but proved to be wonderful! Their food blew my mind. 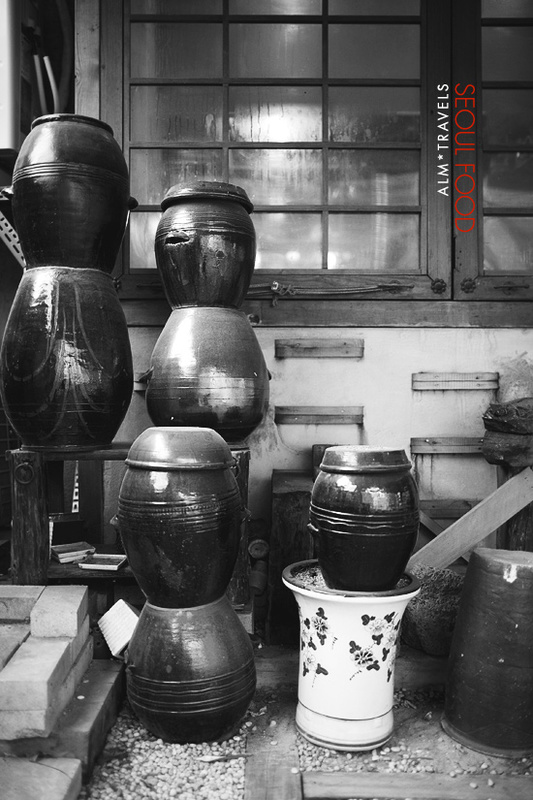 you’ve captured the tone of korea perfectly in your beautiful photos. 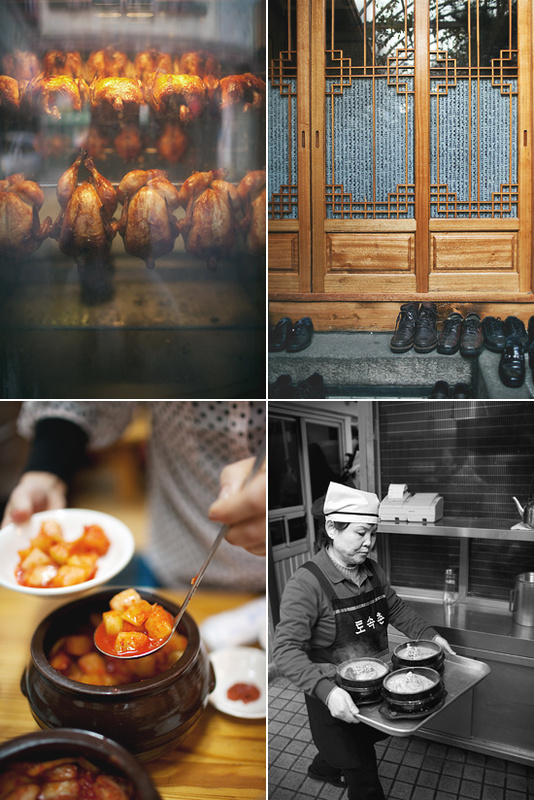 thanks for the inspiration to get out of my own kitchen and out into seoul’s streets to document the burgeoning food scene that awaits right outside my door. Lovely photos! Now I’m hungry…time for some kongguksu! Holy cow, that was an awesome reading/staring session (and drool-wiping session)! I didn’t know shiso/perilla was so popular in Korea, too! Thanks for taking us along your trip! this incredible compilation of text and photos should be made into a small book. i would carry it with me if i were to ever visit korea. so refreshing to see things that i’ve never seen before and now really want to try them out. thank you karleen! hopefully you make it out to seoul, it’s so beautiful. 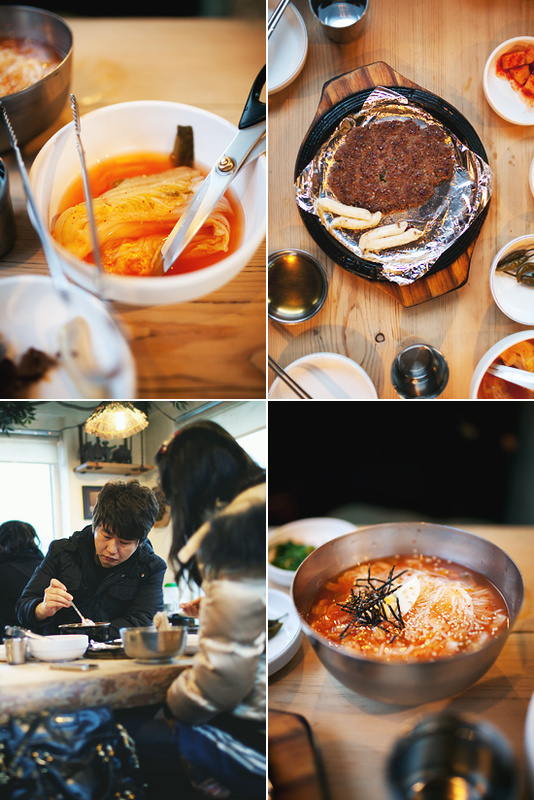 I fell in love with Korean food when I stayed there for a few months. Thank you for taking these lovely photos, to tide me over til I next get to go back! The photos are so amazing! I’m out for my food venture now. 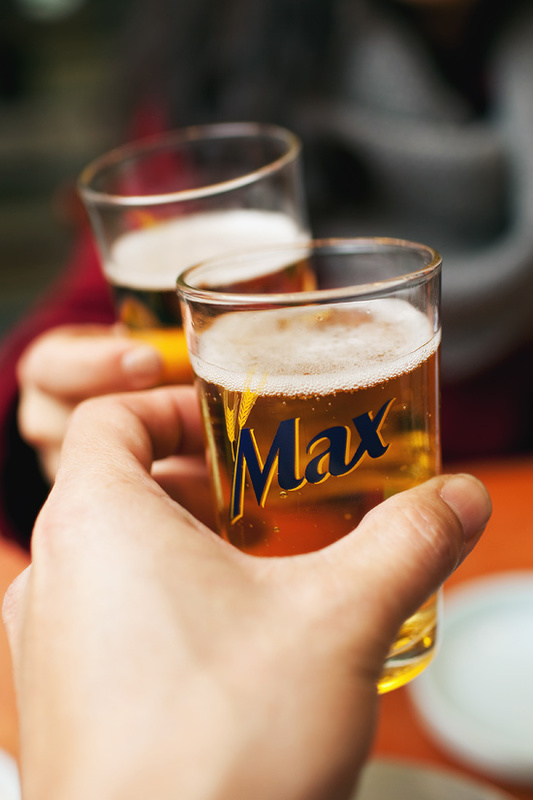 How did you know where to go for the best? Rick… I can’t get enough of your blog! Again looking at these makes you feel like you are right there in Korea. Just beautiful!